Does leaving Ireland make you more Irish? 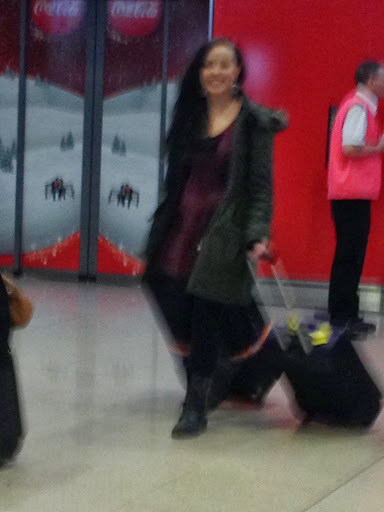 A year ago today I stood in the arrivals hall of Dublin airport, impatiently checking the blinking board to see whether my sister’s flight had landed. When confirmation finally came, I turned my attention towards the sliding doors. It was simple enough to separate the returning emigrants from the casual travellers. The smiles and sobs that accompanied their entrance through the doors gave it away. Some waiting family and friends would scream in delight and run towards their loved ones. Others would stand motionless with tears streaming down their faces, hesitant as though they weren’t sure this moment -this wonderful moment they had dreamed of since they had said their goodbyes years or months previous – was actually happening. It was a lovely few minutes. Then my sister arrived. As she chattered about the time of her life she had had living in Potsdam on Erasmus (the second time of her life that year after living in Southern Argentina for 5 months), I pondered on what defines an emigrant. I didn’t categorise my sister as an emigrant, because she had left Ireland as part of her university degree. Three years previous I returned home after spending a few months on Erasmus in Prague. I certainly wasn’t a returning emigrant then either, though it was fun to pretend while gallavanting around the Czech Republic that I was part of the true diaspora, tragically cast out of my homeland due to a lack of jobs and hope. In reality I studied some poetry, drank cheap beer, wrote some essays and came home in time for the Christmas dinner. Joseph O’Connor – one of Ireland’s most prominent writers- wrote a passage in an article about Irishness which I first read a few years back. By O’Connor’s reckoning, up to March of this year I was an exile in my own country. Not that it stopped me writing about the experiences of others abroad. So many of my friends had left Ireland for work that it was a source of endless fascination to me how they coped with the changes in environment, weather, culture. I wrote my MA thesis on perceptions of Irish emigrants. Emigration was my never-ending source of material and I hadn’t even stepped on an aeroplane. The night before I left for Korea, amid all the last minute rushing, O’Connor’s words popped into my head. I fished out the book and took a picture of the passage to bring with me. My reckoning was that if I hit a rough patch of homesickness in the Far East I could use the words as a soothing balm. They’d be there to tell me that now I was really Irish. In reality, ten months into my time in Korea and I’ve had little use for the words. There have been moments of homesickness of course, and moments of doubt. That fear of missing out you have on nights when all your friends are somewhere and you opt to stay at home? Triple it and you’ll be some way towards realising the terror that can strike when you see friends at home getting their foot on their chosen career ladder. You’re happy for them, but there are times when you wish it was you who had the guts to wait it out in Ireland. Nevertheless, these 10 months have been a joy. There’s a lot to recommend about Korea. It’s not a harsh lifestyle, the cities are vibrant, the work is plentiful and the money decent. The amount of ex-pats over here might surprise you. 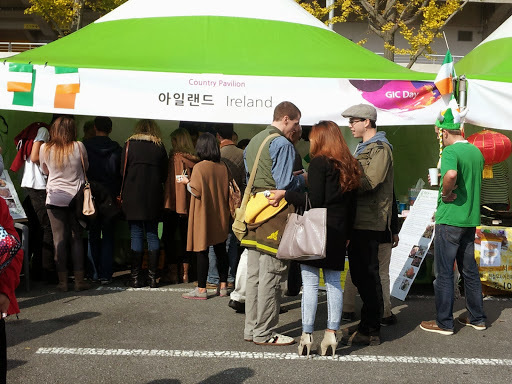 Even in Gwangju, a relatively small city by Korean standards, there is a sizeable foreigner community. Ubiquitous as we are, naturally many of the community are Irish. There were two Irish stalls at a recent international day in the city, there’s an Irish-run bar, and one of the biggest nights of the busy summer months was a traditional music session held there. Sometimes there are moments when it’s difficult to comprehend just how far we are from home. When O’Connor wrote that article, a long time before I read it in an anthology, Ireland and Irish emigrants were different. If you left Ireland, save for a scribbled letters or long distance phonecalls, that was the end of you. You couldn’t really keep in touch with home and home couldn’t really keep in touch with you. Did O’Connor and his contemporaries understand their Irishness more because it was something which was under threat in their new homes from home? Did every pint of Guinness in a dingy London bar mean more because it was a tenuous connection to Ireland? Possibly. Did every tattered photo of a loved one held in an Irish wallet in New York have extra significance? Perhaps. Today’s technology, well, you know the drill. Photos flitting across the globe in seconds. You might know more about last night’s party in Galway than the participants do. You’re in your office viewing the pictures as they’re uploaded in real time, while the subjects of the photo might be a tad under the influence. Where then can today’s Irish emigrants derive a heightened sense of Irishness? There is still something to be said for meeting another Irish person in the middle of nowhere, thousands of miles from home. It’s said that you can link any person to any other person in the world through 6 people. If the two people are Irish, you can probably cut out at least 3 of the links. We’re everywhere and that’s something we get great pride out of. It’s a majorly defining aspect of Irish culture, is emigration. We all know someone from every generation of our families who left the country in search of work and a better life. Some returned, some didn’t. Maybe emigrants become more aware of how Irish they are when they encounter something that at home they would take for granted. It’s well documented the importance of the GAA in local communities at home, but sometimes it’s easy to dismiss it as just a sports organisation. In Korea it’s hard to describe just how popular it is. People from all corners of the globe come together to play for one of the three clubs in tournaments that run throughout the summer. It’s certainly one of the most popular imported sports in terms of members. 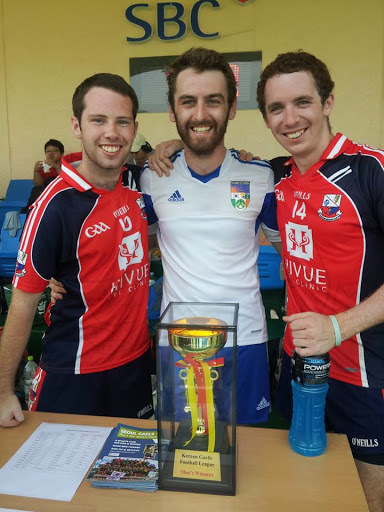 When you line out in a Korean soccer stadium with an O’Neill’s jersey on your back, playing gaelic football alongside and against people from every walk of life, it’s hard not to feel an intense surge of pride in your country. And post-tournament, when the drink is flowing and Irish accents are heard all around the bar, that pride only increases. There is no right or wrong when it comes to emigrating. The people who remain in Ireland deserve recognition for keeping the country going in the face of adversity. Hard work on their part ensures that there’s still a country to come back to for Irish emigrants. However those of us who have left are just fulfilling the quota. It wouldn’t be a proper generation of Irish which didn’t see half its number leave. This 25th of December, every family in Ireland will think of a loved one far away. Meanwhile on Australian beaches, in London flats and small Korean apartments, Irish people will gather and think of home and everyone in it. Maybe Joseph O’Connor was right and maybe emigrants do feel a heightened sense of Irishness sometimes. Ultimately we’re all from the same tree though. It’s just that some leaves fall farther away than others.